Fishing trout is one of the most entertaining and challenging things to do. If you are an angler with years of experience, you have at least once or twice fought these magnificent beasts. But if you are starting in the art of fishing, you’ll find these gorgeous yet strong & squishy fishes one of the hardest to catch. One of the hardest things to do when fishing trout is having the right trout fishing gear setup. Because they are hard, strong, and very tough to catch – you will need the ideal items to do it effectively. With the right gear, you’ll be able to enjoy one of the most exciting fishing experiences out there. Here we are going to show a trout fishing for dummies guide with the most essential gear and items to have before going fishing this fish. So if you want to learn what accessories you’ll need the most when fishing trout – take a step further to find out! There’s nothing more important when fishing than having the perfect rod and reel for your needs. Trout is one of the hardest types to catch, so you’ll need something that fits not only the kind of fish but also the river or stream you’re going to fish at. For small streams with smaller trout, you can go for something ultra-light. If it is 4 or 5 feet and comes with an ultra-light spinning rig, you’ll get an excellent experience. The flexibility and sensitivity alongside an exposed spool will give you everything to fish correctly in small streams. Then you can pick a 4-6 pound monofilament – which will give the line enough strength for small yet tough fish. For large streams or rivers, something larger and heavier will be perfect. Here we recommend medium or heavy action rod & reels, around 6 to 8 feet in length and with a strong 6 to 15-pound monofilament line. If you pick the right reel, you can expect excellent results, especially with the larger and heavier fishes. There are several options when it comes to lures and baits. For trout, though, you won’t have to pick something in specific. So this means you’ll have many options to choose from and little to no restrictions. Trout usually go for crawfish and similar insect imitators when it comes to lures, yet the artificial ones such as spinners and spoons will come very handy. The ability of spinners with metal blades and feathers or a bucktail can help you attract the attention of trout. Spoons move much more, so they will excellent for imitating baitfish. The same happens with plugs, being smaller and lighter for smaller trout. When it comes to baits, you’ll also have several choices to consider, including dough bait, salmon eggs, power bait, and even small dead fishes. However, this all may change when it comes to fly fishers and spin fishers. But in reality, for trout, almost anything works, as long as you use the right size for the specific trout you want to catch. A landing net is probably the most useful item to have that’s not related to the rod or reel. It’s important to consider that trout are one of those hard-fighting fish that won’t give up easily. You’ll have to be prepared to catch them fast but also effectively, so you’ll need a landing net that stands the fight and strength of trout. But many other factors also arise, such as the distance from the handle to the hoop or bow. How long and sturdy is the handle, as well as the depth of the net, are important factors too. You’ll also need the right material and mesh to prevent damage to the fish, but also something strong and durable that will stand the toughness of the fish. For us, we recommend maple wood nets that offer an 8-inches diameter handle with a nylon or polyester mesh if possible. If you want something stronger, aluminum frame can be a great choice too, with a wide enough diameter and a long enough handle. Another critical thing to consider is that trout are also a little fragile in their skin. Despite their strength and toughness to fight, they can get damaged easily if you aren’t careful. That’s why we recommend something delicate as well, enough to prevent them from getting hurt if you want to let them go unharmed later. If you want to keep the fish undamaged, go for a rubber mesh if possible. Paired with a wooden frame, the net will be enough to prevent any fish from escaping but also from getting harmed. A thermoplastic mesh is also useful, it tends to be highly reliable in different places, especially in winter, but also very soft to prevent damage to the fish. Finally, you need to pick the ideal creel. This will help you carry the trout home. Here you shouldn’t overthink as with a net, but we always recommend something strong enough such as a canvas creel or split-willow creels. One of the things that most anglers tend to forget when fishing, is that this activity is not only about standing in the dry shore waiting for the fish to grab the bait, but also that you’ll have to explore through streams, rivers, mud, and sometimes even swamps to find the ideal fishing place. You may eventually find the right location in a matter of minutes, but sometimes it will take you a lot of time. Whether you are going to get dirty or wet, it is essential to have something keeping you dry & clean. And for that, we recommend nothing else than the right pair of boots and hip waders. They will help you keep your feet safe while also keeping your body warm and free of any mud or dirt. Well, at least they will protect you more than being just with a vest and a hat. For us, the most useful are vulcanized rubber hip waders. They will protect you from the feet to the hips and sometimes a little more than that. These waders come inside the boots, which we recommend to be made of artificial leather or rubber if possible, perfect for preventing moisture from entering inside while also protecting your feet like no other material can. Other great options to go for are chest waders that protect your body even more, keeping your chest and back free of any contact with mud or water. They usually come with a polyester construction, yet vulcanized rubber will also be useful. Here, the same boots would help, yet we recommend something higher as chest waders may not offer the same inside-boot design. But if you want something ideal for wearing alongside waders, you can go for a wading pair of boots. These are shin-high boots usually made of high-quality rubber or neoprene, perfect for keeping your feet and legs dry and ready for fishing. They also help to improve grip on challenging surfaces, especially when fishing inside streams or rivers. Some options even come with convertible soles, for better results. Some fishermen like to get rid of the hooks after catching fish with their hands. A hard pull in the hook and it will come out instantly if you are experienced enough. But this could also be dangerous, especially when we talk about trout that have sharp teeth and a wide bony mouth. That’s why there’s nothing better to take the hook off from trout than the ideal forceps. This way you will unhook the fish without much trouble, keeping your hands away and always being careful to prevent the fish from getting off your hands. We recommend stainless steel forceps for their strength yet light design. But the right pair of iron forceps will do the job just as well, with an even stronger grip. Prepare your Trout Fishing Gear Now! 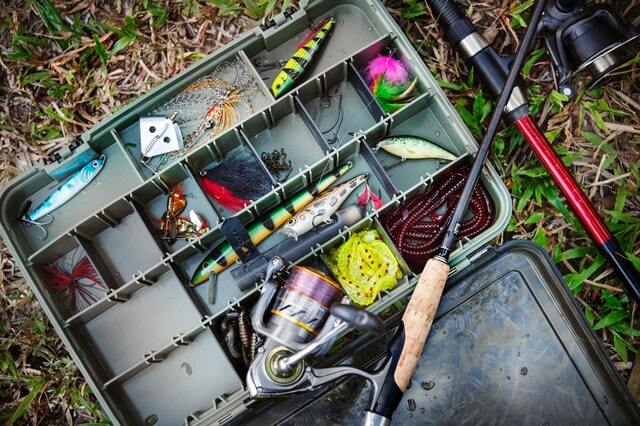 Now that you know everything needed for the perfect trout fishing gear setup, it is time you start preparing your items. Remember that trout is not an easy fish to catch and one of the most exciting out there. So you’ll want to be ready before going fishing – so you can do it more effectively & effortlessly.